Clockwise from top left: Betsy DeVos, Steven Mnuchin, Wilbur Ross, Elaine Chao, Jeff Sessions, and Tom Price. President-elect Donald Trump boasted about his wealth during his campaign. Now he’s surrounding himself with people who have similarly unimaginable riches. Collectively, the wealth of his Cabinet choices so far is roughly four times greater than President Obama’s Cabinet and nearly 30 times greater than the one George W. Bush led at the end of his presidency. And Trump has named less than half the group of advisers so far. The net worth of the Cabinet Trump had selected as of Thursday was at least $11 billion, based on available estimates, or more than the annual gross domestic product of about 50 small countries. It also included the $5.1 billion in net worth that Forbes estimated belongs to the family of Betsy DeVos, the former Michigan Republican Party chair and education activist selected to be education secretary. Investor Wilbur Ross, picked to become commerce secretary, is estimated to be worth $2.5 billion, according to Forbes. Steven Mnuchin, the former Goldman Sachs executive in line to become Treasury secretary, is worth at least $46 million, according to Politico. The pick for transportation secretary, Elaine Chao, the former labor secretary, was worth an estimated $16.9 million as of 2008, when she last held public office, according to the Center for Responsive Politics, a Washington-based nonprofit that tracks campaign finance data. Two other Cabinet picks — Alabama Senator Jeff Sessions for attorney general and Georgia Representative Tom Price for health and human services secretary — were estimated to be worth about $7.5 million and $13.6 million, respectively, as of 2014, according to the center. One of the least wealthy members of the Cabinet was actually Trump’s running mate. Vice President-elect Mike Pence was worth about $211,000 as of 2012, data from the center show. Beyond what's listed below, the president-elect still has to fill nine more official cabinet positions and five more "cabinet-rank" spots. There are also non-cabinet level appointments to make. One such pick he has already made, for deputy commerce secretary, is Chicago Cubs co-owner Todd Ricketts. He and his family are estimated to be worth $5.3 billion. Note: All are current estimates, except for Sessions and Price (2014), Pence (2012), and Chao (2008). Trump has said he is worth about $10 billion. DeVos' estimate is her family's net worth. Mnuchin's is described as "at least." Other wealthy people may also soon join Trump’s Cabinet. One potential pick, oil and gas company executive Harold Hamm, who is said to be in the running for energy secretary or interior secretary, is worth an estimated $16.9 billion, according to Forbes. Mitt Romney, said to be in the running to become secretary of state, was estimated to be worth about $250 million as of 2012. Ben Carson, a potential pick for housing and urban development secretary, was worth $26 million as of 2015, according to Forbes. Another contender for multiple Cabinet spots, Rudy Giuliani, is a multimillionaire, as is Andrew Puzder, who is said to be in the running to become labor secretary. By comparison, the collective estimated net worth of Obama’s entire current Cabinet is less than $3 billion, according to available estimates. And the vast majority of that wealth is held by just one member, Commerce Secretary Penny Pritzker, who is worth $2.4 billion, according to Forbes. The Cabinet that served Bush at the end of his presidency was worth about $390 million collectively. The figures above consider only the presidents and their official Cabinet members and officials holding “cabinet-rank” positions. The calculations do not consider other important presidential appointments. If they did, the collective net worth of Trump’s Cabinet would grow by at least $5.3 billion. That’s what Forbes estimates Todd Ricketts and his family are worth. The Chicago Cubs co-owner has been picked to serve as deputy commerce secretary. Another key appointment, former Breitbart executive Steve Bannon, who will be Trump’s chief strategist, is a multimillionaire, according to Politico. 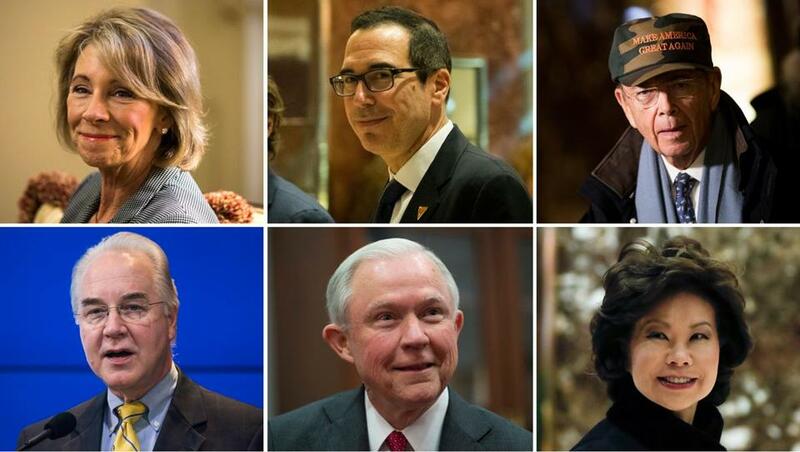 Trump’s affluent Cabinet picks are, in some ways, not surprising. He touted his own wealth and business experience as being key attributes that qualified him to be president and would help him boost the country’s economy. He also regularly stressed that he wanted to upend the existing political establishment. But Trump’s critics have said the picks represent a departure from his anti-Wall Street rhetoric during the campaign, and they’re out of touch with the working-class Americans whom he vowed to champion during the campaign. Click each name for more details. Some positions require Senate confirmation. A "Y" indicates the person has been confirmed, an "N" indicates they have not been confirmed, and "N/A" means Senate confirmation is not required for that post. Positions left blank have not yet been filled. *Fast-food executive Andrew Puzder was nominated to be Labor Secretary but later withdrew his nomination. **Retired lieutenant general Mike Flynn was nominated to be National Security Adviser but later resigned. Retired Army Lieutenant General Keith Kellogg served briefly as the acting national security adviser. ***Fox News analyst, Reagan administration official Kathleen Troia "KT" McFarland was nominated to be Deputy National Security Adviser but later left the post and was expected to become U.S. ambassador to Singapore. ****Wall Street executive, Florida Panthers owner, and Army veteran Vincent Viola was nominated to be Army Secretary but later withdrew his nomination. After Viola withdrew, Tennessee State Senator and former Army lieutenant colonel Mark Green was nominated, but later withdrew. *****Businessman Philip Bilden was nominated to be Navy Secretary but later withdrew his nomination. Matt Rocheleau can be reached at matthew.rocheleau@globe.com. Follow him on Twitter @mrochele.